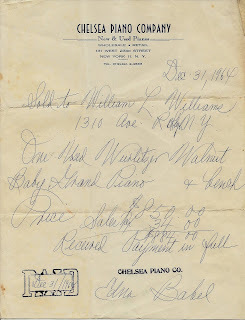 This is the piano my Father bought for my Mom on the last day of December, 1964. The piano was delivered several days later to our apartment in Brooklyn. But there was a problem; it didn't fit in the elevator, and was too unwieldy to make the turns in the stairwell. Clearly, another way would have to be found. At the time, we lived on the second floor of a 7 story apartment building. We lived in the rear, which gave us the advantage of having the roof of the building's underground garage right outside of our windows. This expanse of concrete ran the entire length of the building, which sat between East 13th and 14th Streets on Avenue R. At each end there was a straight stairway which led directly to the street. This was the path our piano would take to its new home. The piano movers were really at a loss when they found that the piano would not fit in the windows. Summoning John Bucholtz, the building's German, as in ex-Nazi, superintendant, my Dad and he surveyed the situation and came to a quick conclusion; at least one of the windows, would have to come out if the piano were to go in. Now this was the first week of January, not the best time to rip out a window and frame in order to accomodate a piano, but there was nothing for it, and so the piano movers, my Dad and John removed the window and wedged the piano, minus the legs, inside. Then they all helped in setting it up, where it would remain for the next 22 years, until my Mom had passed away and my Dad was getting remarried. That's when I got the piano. 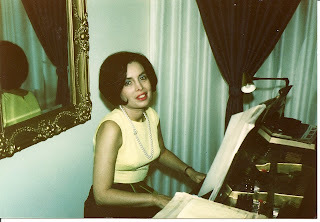 Again, in the first week of January, only this time with snow on the ground from Brooklyn to Baltimore, which is where the piano was headed, as I lived there at the time. I seem to remember taking the legs off and carrying it into the elevator and loading it on the truck. My Uncle Bob was there and I'll have to ask him what he remembers about that day. Here's the funny part; I do not remember having to remove the window to get the piano out of the house. When I got to Baltimore, via U-Haul, with the piano, there was 1 foot of snow on the ground. It took 5 friends and neighbors to help me wrestle that piano into its new home. From there it was moved again to Hampstead, Md., where it remained for 11 years, until we came to North Carolina in 1998. That time, and each of the 2 times since, we have hired someone to move it. The piano is still with us. That's my Mom in the picture, moments after the piano was set up and the window closed, smiling like she just got a piano. She used to play and sing Broadway show tunes, and all of the old women would be gathered outside our apartment door, listening. They would always say the same thing, "Oy, she sings like a bird, she should be on stage!" And maybe she should have, at that. I don't play, which sometimes makes me a bit sad, I view it as a lost opportunity, though I suppose I could still learn. However, I do play guitar a bit instead. My daughter learned to play on this piano, which she will take when she and her husband Michael have more room. Meantime she has a small electric piano that she plays on to keep nimble. It comforts me that this one will be passed on to her.